Art historian Charmaine Nelson, who specializes in the history of slave ads, is this year’s William Lyon Mackenzie King Chair for Canadian Studies at the U.S. university. Dr. Nelson, the only Black tenured professor of art history in Canada, will be taking a year off from her job at McGill University to further her research on Canadian fugitive slave advertisements and teach at Harvard. 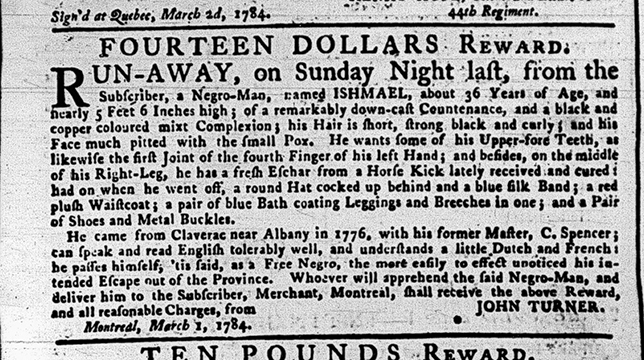 These ads are meticulous physical descriptions of enslaved people written by their owners, which were used during auctions, sales, or as notices of runaway slaves. An example of one of the ads. Dr. Nelson says her work on the Canadian fugitive slave archive will focus on a comparative study of ads from Canada (specifically Nova Scotia and Quebec) and Jamaica, as well as visual representations of creole culture and human activity. “My focus is on humanizing people who were dehumanized,” she says. Teaching Canadian slave history to American students, who come with their own understanding of slavery as it occurred in their own country, is both a challenge and an opportunity to educate, Dr. Nelson says. “For a lot of people in the States, no matter how well they know about the Black diaspora, Canada is not on their radar.” While at Harvard, she’ll teach two courses: an introduction to historical Canadian art and a course on Canada’s role in the transatlantic world. The 50-year-old Mackenzie King chair is open to researchers in any field in the social sciences, humanities and professional studies. Dr. Nelson is the second art historian to hold this post at Harvard, and only the second Black professor (the other being George Elliott Clarke, the award-winning Nova Scotia-born author and a professor at the University of Toronto). I studied Caribbean history for years and not once did I learn about Canada’s role in slavery. It just did not occur to me! This news has inspired me to do research in this area. Well done Prof. Nelson! I think this is wonderful! As an assist, if anyone is interested, I perform a one-woman play called, “Things My Fore-Sisters Saw” in which I portray 4 Black women who impacted Canadian history. I have been performing it in schools in Ontario for almost 2 decades. Students who see it know that there was slavery in Canada amongst other details of the early black experience in Canada. If any teacher/educators are interested they may contact Prologue to the Performing Arts in Toronto to arrange for a visit of this educational program to your school. My website, lesliemccurdy.ca, has more information. There was slavery in the Canadian colonies of Upper and Lower Canada, New Brunswick and Nova Scotia, because they were part of the British Empire. At the time of the American Revolution, many Black Loyalists moved to these colonies as free people. Britain ended slavery in Great Britain and the colonies in 1833. The colonies became a place of refuge for many runaway slaves, of course. You might find it interesting to check out Beaver Harbour in New Brunswick (at the time part of Nova Scotia) where in 1783 a group of Quakers from New England established a settlement that clearly stated ‘No Slavemaster Admitted’. Congratulations on this appointment and on following the distinguished Dr Clarke in this position. May History be silenced no more!